This beautiful Chapel was opened on 1st October 1995, by then Archbishop of Dublin, Desmond Cardinal Connell, DD. It was re-located from its original site at 2o, D’Olier Street, where it was opened in 1970. 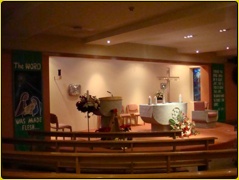 The Blessed Sacrament Chapel provides the people of Dublin, shoppers, workers, tourists and visitors with a sanctuary where they can come to pray or to seek guidance or counselling. It is indeed a oasis of peace in the heart of the city. The Chapel is designed by architect Paul Clinton of Dublin, to create an atmosphere of prayer and adoration, and a sense of celebration among God’s people gathered for the Eucharist. As one enters the Chapel, the eye is drawn towards the altar and the monstrance. They are central features of the Chapel, the unifying points which determine the theme and layout of the Chapel, and from which and in which all other elements find their meaning and significance. The altar is the centre of the assembly, the monstrance the focal point of prayer. The design of the Chapel, then is simple, so that attention is fixed on the monstrance and altar. The Monstrance, designed by Richard Enda King in 1970, has become a very well known symbol of all that the Blessed Sacrament Congregation stands for in Dublin. The impression conveyed by the monstrance is essentially one of peace. Yet it also incorporates tension and struggle, signifying that the Eucharist is also a dynamic presence, a transforming power of the world. The host is held in a central panel, finished in a dark blue enamel, surrounded by a silver-plated surface that is somewhat uneven, almost as if it were struggling for completion within itself. As the light falls on the monstrance and one views it from various angles, the ever-changing light and shadow surround the circle of the host, reflecting the “tension for grace” at work in humanity, which is the meaning of the Eucharist – Christ in His effort to shape humanity to His perfect design. The work is never complete, and the Eucharist is with us to see it through. The slim conical stem rises naturally and easily from the altar and its line clearly shows the oneness of monstrance and altar. The Tabernacle, the Tabernacle Lamp and the Cross draw their significance from the monstrance, reflection both its peace and its tension in their silver-plated surfaces. The white dove on the Tabernacle door shows us the Spirit hovering as if it were over the deep, struggling to create order out of the chaos, to transform the world. The silver-plated figure on the cross, executed by Michael Burke, shows Christ pouring out His life in His Supreme struggle to shape humanity to His own likeness. Mounted in a recess on the sanctuary wall, it also acts as a processional cross – the figure can be seen on both sides. The Altar, sculpted by Eamon O’Doherty, stands out amid the simplicity of the Chapel around it. Its centrality is emphasized by the semi-circular arrangement of the seats, which ensures that gathering of the people around it as one for the Celebration of the Eucharist – Christ drawing all people to Himself. Its sculptor has achieved something of the character and solidity of early Christian Irish stonework, and the overall forms are reminiscent of the early “Tau” or “T” shaped crosses. The incised design is derived from a panel on the Moone high cross. The Lectern and Chair are designed to match the Altar. Other elements of the Chapel, beautiful as they are, are positioned at the rear so as not to detract in any way from the Eucharistic character of the Chapel. The Statue of Our Lady of the Blessed Sacrament shows the Mother of Christ lost in contemplation of the Word and the Sacrament, the two “tables” of the Celebration of the Eucharist. The Reconciliation Area is clearly marked as a place apart by the beautiful mosaic of the Prodigal Son returning to his father’s house to be forgiven and welcomed home. The Stations of the Cross are depicted in a unique style – etched on a glass screen above fields of wheat, indicating the Eucharistic Sacrifice. 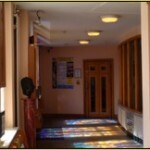 The beautiful stained-glass windows are designed by George Walsh. Standing at the entrance to the Chapel, they depict the gathering of people to the Church. The overall colors of yellow breaking through blue suggest light in the midst of darkness. The water shown at the base of the windows reflects the river flowing nearby and symbolizes the renewing waters of Baptism. The Book and Chalice remind us again of the Word and the Eucharist. The windows are a passage from a hectic world to a place of silence and union with God.